We don't assemble the LED neon lights with power cord for different length requirements. It's very easy to assemble it by following our instruction. Yes, Shine Decor is from China, BUT we don't like price war, short high profit with poor quality and vicious competition. We like just keep quiet, focus on our products, our customers, our technology. And we do like this in the past 14years at Lighting business. Most of our clients have cooperated with us more than 10 years, though they know we are not the CHEAPEST supplier. Please consider we use Best LED chip, circuit board, 100% copper wire (UL standard wire) for our quality guarantee. We offer 1-year warranty for all the LED products. We established our own warehouse and representative office in US for all the after-sales service. If for any reason you are not absolutely satisfied with your order, please contact with us by send message or email to "shine-decor lighting", we will respond in 24-hours and make things perfect. NOTE: ① dimmer not include, need order separately, ASIN: B0774J4D9H. ②This neon is DOME shape, NOT ROUND shape. ③For the straightest possible mounting option, please find "Aluminum Channel Track (ASIN: B01MPWVE3E)" in our shop. LED STRIP ROPE LIGHTS MAX CONNECTABLE LENGTH: 150ft per lead wire. 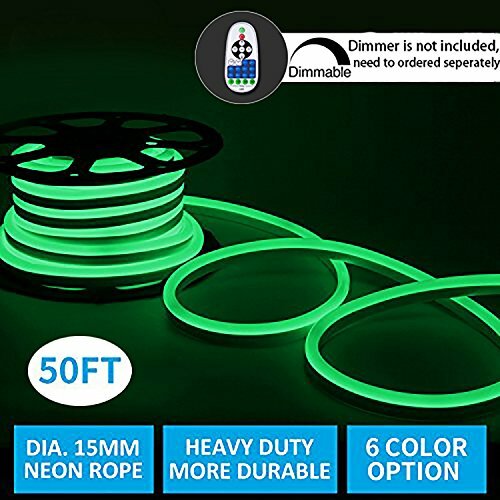 Note USE DIA.15mm neon rope accessories from Shine Decor shop, ASIN [B01MS4SU2Z]. WARRANTY: Shine Decor® is a manufacturer brand from China, which has been in LED lighting products since 2004. We have warehouse in US and offer immediately after-sells service. All our LED rope lights come with an 1-year warranty, if you are not satisfied with our products, please contact us by "shine-decor lighting", we will respond you in 24-hours. If you have any questions about this product by shine decor, contact us by completing and submitting the form below. If you are looking for a specif part number, please include it with your message.